Resting on a hammock is an entirely different feeling, it keeps your body rested, and increase the comfort by changing its shape according to your body. Hammocks were developed by the native of Central and South America for sleeping. They used trees as anchors to hang the hammocks, but now, today, houses are more organized which means we all do not have trees or posts in our houses to hang a hammock. 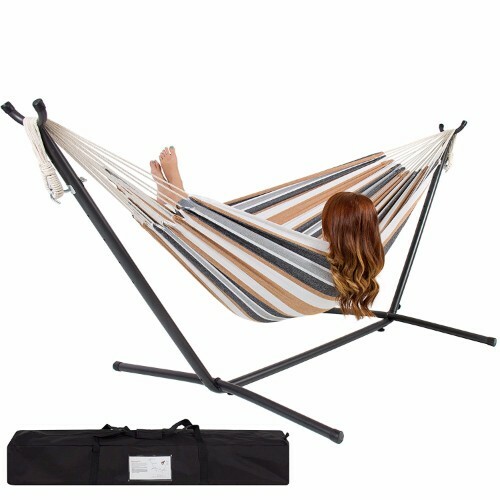 Here is a solution to this problem, a hammock with stand can help you enjoy the sleeping, swinging, or resting. You can also use hammocks for a baby lounger. In the below list, we present the best hammock with stand. Vivere presents a range of hammocks to provide you with a more comfortable and a cozy lifestyle. These hammocks fulfill many of your purposes. You can sit or sleep on it, you can keep your clothes on it, or whatever you want to do with it. The length of this hammock is 130 inch and has a capacity of 450 pounds. So very easily it can accommodate two adults. The fabric, cotton, makes it very comfortable for you to sleep on it. The 9-foot stand is made up of heavy steel and is very strong. It gives a perfect balance to your hammock. It is very useful for kids in the house, as this product completely entertains kids and babies of the house. This hammock gives you the perfect soft cozy feel which you deserve after coming back from work. You can even keep this in your garden area or your living room or your hall. Keeping this hammock in your house would make your house look prettier than ever. It gives your house a stylish and modern touch. So bringing this product in your house will give you happiness in all ways. Once you sit on it, you are close to the ground, even on using the highest hole in the stand. Easy assembly even without tools. The stand is very strong. 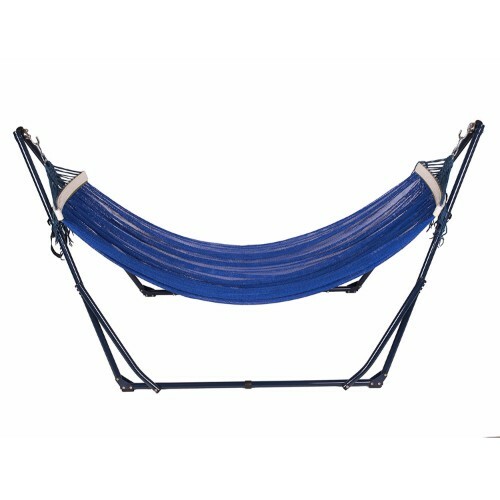 Best choice presents a double hammock with space saving steel stand. 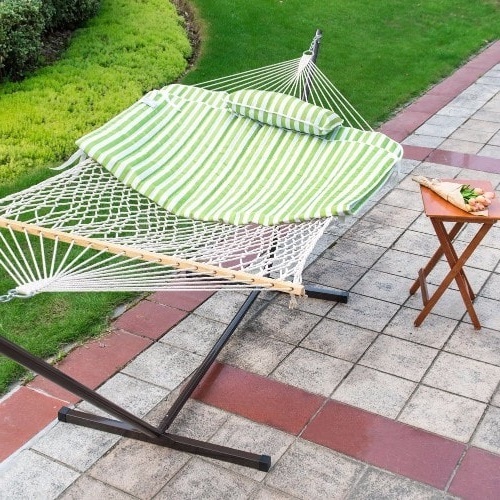 Now deficiency of space would never become a problem for you because the stand of this hammock is specially designed so that it can easily adjust itself in any area where there is a bit less space. Made up of cotton, this hammock provides a lot of comforts. The stand is durable and is resistant to all types of weather. So it is used for both indoor and outdoor purposes. You can relax on it with your friend as it can accommodate 2 adults easily (approx 450 pounds). The kit contains a carrying case so that you can store it safely whenever it is not in use or even it makes the transport of the hammock very easy. Best Choice Hammock is the best choice for you if you are looking for a good quality hammock even for the rooms which have a smaller area. The beauty of this hammock will always remind you that you have invested your money in a good thing. The width of the hammock is more than enough. The hammock is 100% cotton. 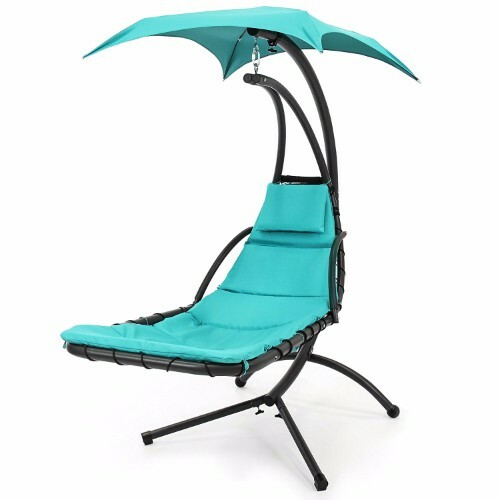 Best Choice Swing Hammock gives you the most lavish look. You can refer it as a modern hammock because of its ultra-stylish looks and its curved lounge design. The stand is made up of metal which is powder coated which makes it water resistant. So you can either use it for indoor purposes or outdoor purposes.It has an umbrella shaped canopy which is removable, i.e. when you use it for outdoor purposes you can use it and when you use it for indoor purposes then you can remove it. Foam filled cushions and one pillow is also provided to give you the best comfort possible. If you need something very classy for your house then you can always opt this product, because keeping this hammock in your house will not only make it more glamorous but also very attractive and modern. So bringing the Best Choice Swing Hammock to your house will upgrade your house to a new level. Comes with cushions and pillows. Assembling the parts is a bit difficult and time taking. People from all age groups can use it. Searching something for your garden area? You will get it right here. Algoma Cotton Rope Hammock provides you with the best hammock for outdoor purposes. Looking at it will make you realize that it looks very similar to those old authentic hammocks. The 11 feet long hammock gives the accommodation of two people. 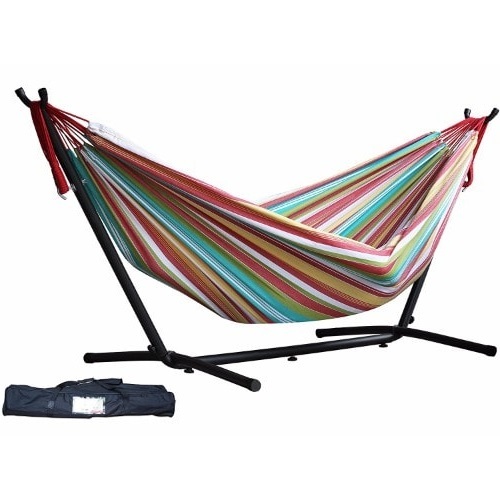 It is very durable, the ropes are made up of cotton and are hooked upon a heavy and sturdy stand which provides a perfect balance to the hammock. The kit includes a pillow, pad, and a drink holder to provide you a perfect comfortable posture keeping your important things besides you. If you are looking for a hammock which makes you remind the old times when those jute hammocks were used then you should definitely go for Algoma Rope Hammock. It has all the perfect features like, it is very comfortable and it is the modern version of those authentic hammocks. Light enough to move from one place to another. Does not look so good when used indoor. Comes with a pillow, pad, and an i-pad or drink holder. Ropes are made from 100% cotton. The wooden construction of this hammock makes it very unique. Not many hammocks are made up of wood. Used for outdoor purposes this product is super comfortable and very good looking. The hammock is made up of durable cotton which makes it very cozy for you to sleep or sit or snuggle on it. The wooden frame is coated with varnish to protect it from the outdoor atmosphere and also prevents fading of wood. The hammock is connected with steel rings to the wooden stand which makes it strong and trustworthy that you won’t fall from it. 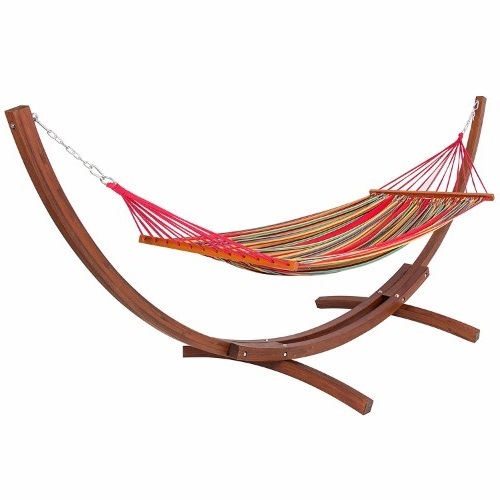 This wooden hammock is a very pretty product, you can use it for decorating your garden or your balcony area. It is very attractive and all the people who see it will wish to sit on it. So bringing this wooden hammock to your house would give you that satisfactory feeling of spending money in a right thing. Because of cotton, the color of the fabric slightly fades away with time. The stand is really sturdy. Only one-time assembly is required. Waking Up early is always a difficulty for everybody, So here we present Best Alarm clock for Heavy Sleepers 2018. Either cool summer night or sunny winter afternoon, this hammock perfectly suits all kinds of weather conditions. It has a very sophisticated look which keeps it among the top hammocks available worldwide. The hammock is made up of durable fabric which makes it weather resistant and which also makes it perfect for outdoor. It is 13 feet long and can easily accommodate 2 people at a time. Because it is too long so it even gives you extra space to snuggle and move freely in that area. It has a huge 14 gauge steel stand which is very powerful and has powder coating which again makes it very durable. This is a stylish and an authentic hammock which is very strong as compared to the other hammocks. So if you need a good, durable and strong hammock then you can always go for Island Bay Free Standing Hammock. Difficult to move because of its large size. When comes to quality, Support is one of the best companies for hammocks. The company ensures to give you the best hammocks so that you do not have any problem in using it. The stand of the hammock is made up of steel and is very strong. It is also made with the space-saving technology so that you can use it even when you have a shortage of space. The stand also has 5 adjustable features, you can adjust it according to your convenience. It can accommodate up to two people at a time, so, on your holidays, you can just relax with your partners very comfortably. It is also provided with a carrying case so you will never have any problem in moving it from one place to another. Bringing this hammock to your house would give you ultimate relaxation. Because of its good quality, you will never have any headache of repairing, returning or replacing it. Comes with a 30-day money back challenge. The hammock is near to the ground even on the highest hook. Hammock with stand is easy to assemble. 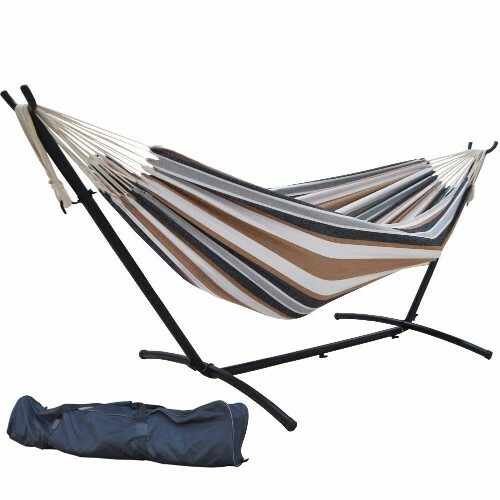 Sorber presents a hammock with spreader bars and detachable pillows which are a unique feature.It is made in such a way that you can use it for outdoor as well as indoor purposes. Available in green and blue colors, Sorber Hammock provides you the most comfortable and cozy hammock. 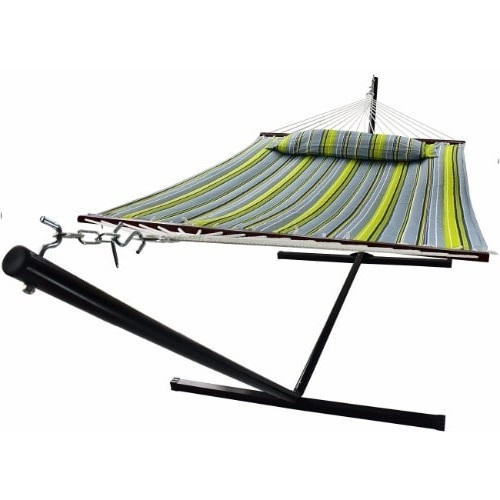 It comes with a spreader bar which will help you to adjust the hammock according to your height and convenience. The hammock is made up of weather resistant cotton fabric which is machine washable and you can easily wash it in your house. It can accommodate up to two people, so feel free to sit and relax on it. In conclusion, bringing Sorber Hammock to your house will be exceptionally good because it has many exceptional and unique features which other hammocks hardly have. So if you want to purchase a good hammock, then you can always go for this product. The stand is sturdy and stylish. Does not comes with the waterproof technology. Need something authentic? 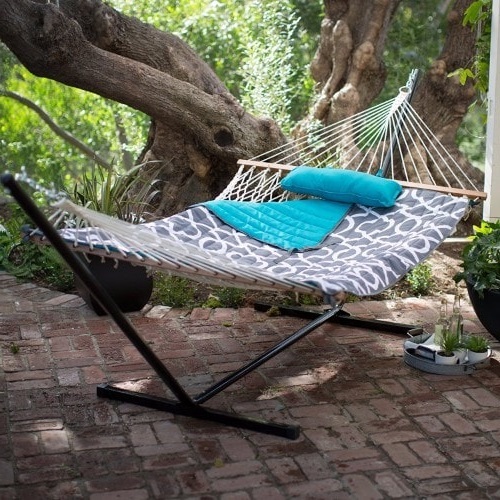 Then go for the Sundale Outdoor Hammock. Because it gives you the feel of those hammocks used in the old times in beaches. It is specially designed to fulfill the desire of those people who want those old hammocks back to their lives. The hammock comes with a reversible striped polyester pad and one soft pillow. Reversible because you can turn it either side when you feel that the side has turned dirty. The ropes are made up of cotton and are handcrafted. The ropes are very thick and strong. The stand is made up of powder coated steel which makes it weather resistant and perfect for all types of outdoor temperatures. If you are an antique lover and you love those authentic things then you should go for this product. Because it looks exactly like those old hammocks, but here you won’t need any trees to hang your hammock because it has a stand which is very helpful. The weight handling capacity is not very high. The stand is rust resistant. 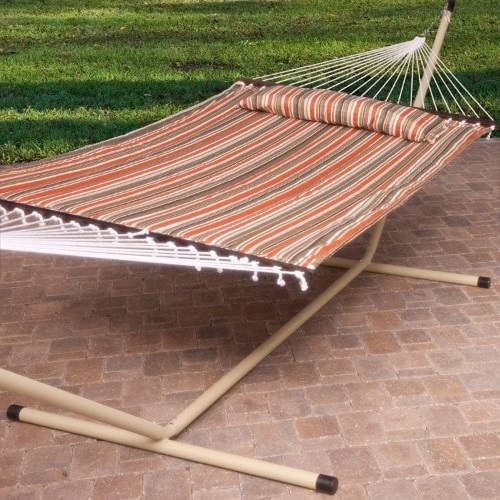 The advantage this hammock stand set has above all the other sets is that, it is foldable. This hammock is specially made to solve the problem of moving or shifting your hammock from one place or city to another place or city. If you are a traveler and you have to carry this hammock with you, then you can very easily transport it from one place to another. The stand of the hammock is adjustable, i.e. you can adjust it to the height you find perfect. It gives accommodation of one person and is absolutely perfect for the people who love to have a sun bath. This foldable hammock with stand is especially recommended for those people who have to travel to different places because of their jobs. Just fold the hammock, keep it inside the provided bag and carry it wherever you want to very easily. Tall people will have a problem in getting into this hammock. Comes with a carrying kit.